H35S.M drilling rig is made for vertical boreholes with the use of a quick-rotary wet drilling (right circulation) or core drilling. Also rotary dry drillings can be conducted with bucket auger or screw auger with the use of casing pipes as well as percussion drilling in which drilling material is removed by bailer mounted on drill string. 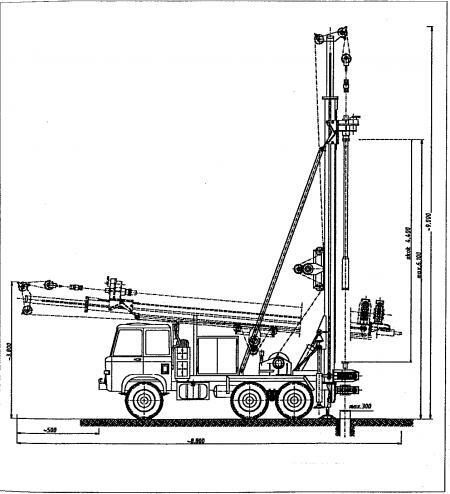 Drilling rig is mounted on MAN TGS 26.320 chassis (Fig.1, 2) and powered by an independent combustion engine Mobil 5-W40 of 105 kW. Maximum range of core drilling Ø146 mm with the use of “throw into” method is 150 m and cased drilling with the use of percussion – rotary method of diameter Ø298 mm – 50 m.
(Fig. 3). Drilling bit of inside diameter of  102 mm and length 1500 or 3000 mm is placed at bottom of the borehole, during drilling it is filled up with soil (core uptake). Filled up core barrel is pulled out with the use of winch and after placing sample (core) into a box is throw into a borehole again. The drilling is carried out with bentonite drilling mud (slurry), the parameters of which is adjusted for drilled soil. Drilling fluid is pumped into borehole constantly through entire volume of casing pipe, from where removes drilling material through space between pipes and borehole walls at the same time stabilizes wall of the borehole. At the surface drilling fluid is collected in sedimentation tank where drilling material is separated (through sedimentation) from drilling fluid which is used again in drilling. Drilling rig can also be equipped with other systems of core drilling. a slow-rotary method with continuous flight (screw) auger. Drilling with method a and b is carried out in casing pipes screwed with threads. 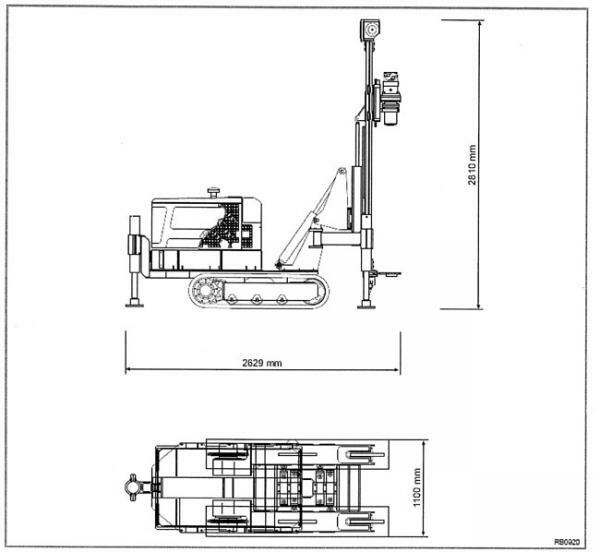 Maximum range of drilling is 50 m.
Drilling rig is mounted on STAR 266 track (Fig.1, 2) and powered by an independent compression – ignition engine URSUS-PERKINS 3250A of 34 kW. Fig 1. 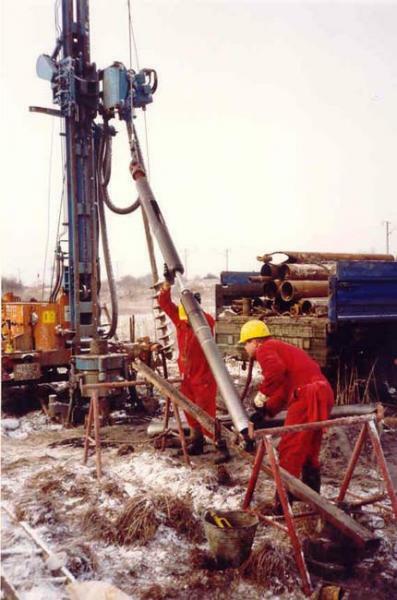 The H30S drilling rig during cased drilling. 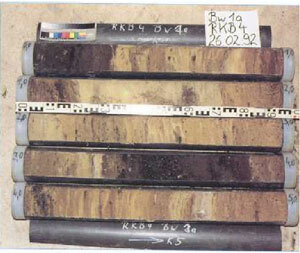 Type of drilling tools is adjusted to the drilled soil. Dry sands and cohesive soils are drilled out with the bucket auger and saturated non-cohesive soils with the bailer. A continuous flight auger drilling is used in simple soil conditions, drilling for mineral resources (aggregates) as well as in the cases when (short) time and (low) price are decisive factors. Drilling rig ŁBU is designed for vertical drilling of maximum diameter  200 mm. Drilling is carried out with continuous flight augers without casing. This machine is used in simple ground conditions, in mineral deposits prospecting and also in cases where decisive factors are (short) time and (low) drilling costs. 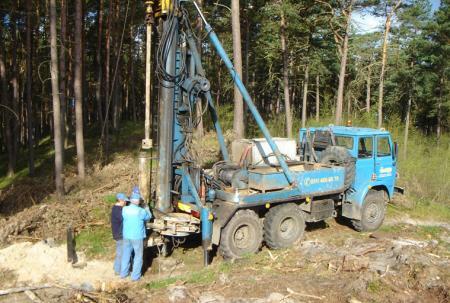 Drilling rig is mounted on ZIŁ truck (what allows to access also in rough conditions) and powered by a compression – ignition engine. 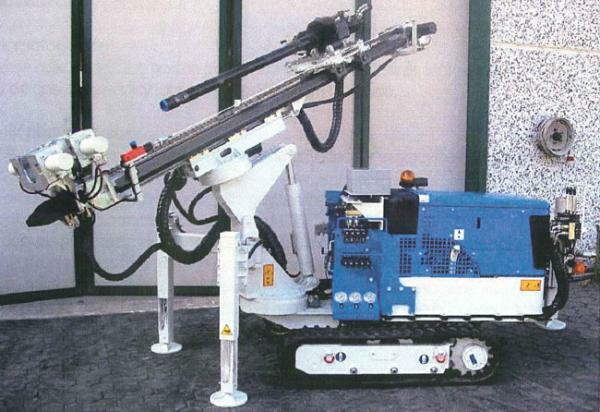 Maximum range of uncased drilling is 50 m.
This rig is rarely used nowadays because of its limited possibilities, but it can be successfully used e.g. to confirm lithological profile of substratum initially investigated with CPT or DPSH penetrometers, what can significantly reduce the necessary drilling costs and time. 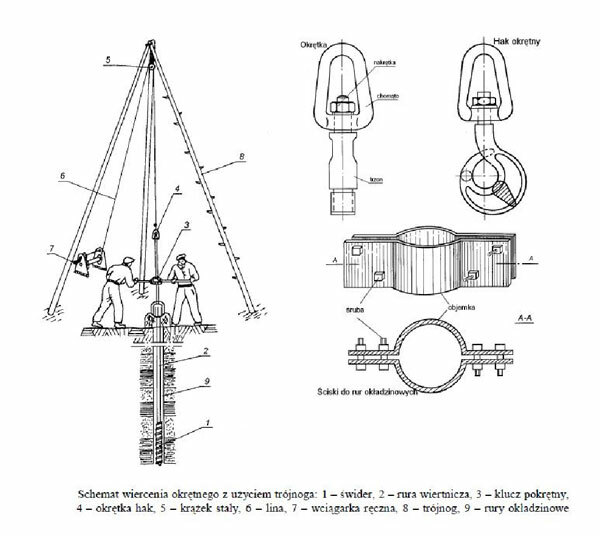 Drilling rig ŁBU is designed for vertical drilling of maximum diameter Ø 200 mm. 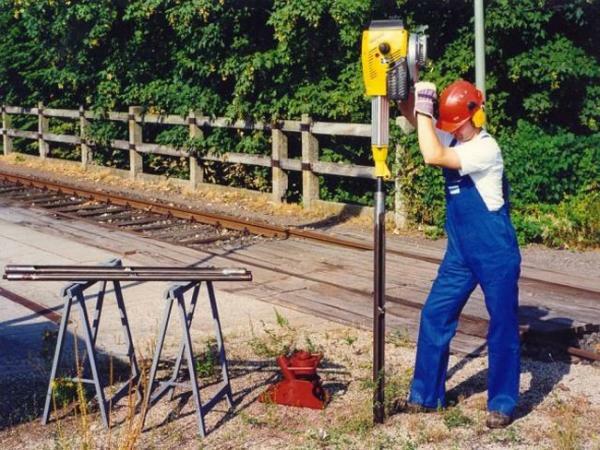 Drilling is carried out with continuous flight augers without casing. This machine is used in simple ground conditions, in mineral deposits prospecting and also in cases where decisive factors are (short) time and (low) drilling costs. Window sampler RKS manufactured by Nordmeyer company is designed for soil sampling with the use of percussion method. Sampler is driven into the soil with the use of combustion or electric hammer. This method allows for drilling with continuous sampling of the diameter to Ø100 mm. Typical range of drilling is ca 10 m, or even more in favourable conditions. a cable tool drilling with the use of bailer lowered into borehole on drill string. Tripods are used mostly in limited access areas where cased drillings are necessary, also for drilling on the water (Fig 2). Cased drilling starts with bucket auger (“Schappe”) with diameter Φ225 mm. Casing pipes Φ203 mm are lowered into borehole after drilling out at least 1 m of soil or after meeting ground water table, then the drilling is continued with auger of smaller diameter, and pipes are pushed manually during drilling. BPE 130 device is a percussive soil sampler. The sampler is driven into the soil with the use of a 70 kg hammer dropped from the height of 400 mm. A-class undisturbed samples of very high quality and of the diameter of Ø 100 mm are obtained this way. 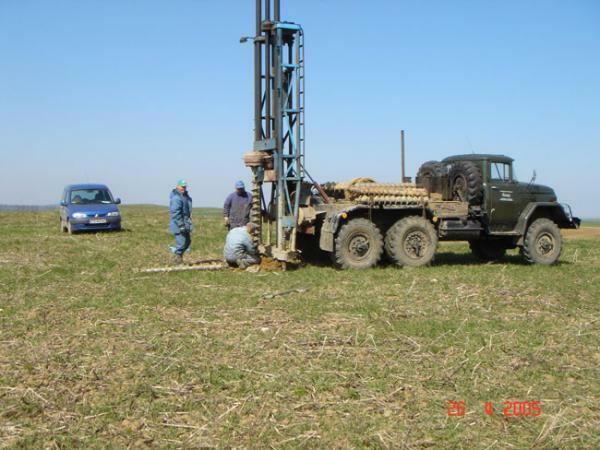 The method allows to make continuous sampling in cased boreholes. As the cores are taken to PVC pipes, they can be transported and stored in a safe way.